'Desirable' (Nut photo a) (Nut photo b)Orig. by controlled cross (unknown parents) made by C. Forkert, Ocean Springs, Jackson County, MS. Parentage of Forkert's first introduction, 'Dependable', was 'Jewett X 'Success'. Similiarity in appearance led to speculation that 'Desirable' is a sibling. Another controlled cross by Forkert, 'Admirable', was 'Russell' X 'Success'. That parentage has also been suggested for 'Desirable'. Isozyme analysis is consistent with 'Russell' X 'Success' parentage, while the genotype of 'Jewett' remains undetermined. Cross made in 1903. Introduced by Forkert as 'Desirable' in 1914, but not widely distributed until after Forkert's death in 1928, when USDA-ARS, Philema, GA, tested it as # 7191, beginning about 1930. Identified by USDA as Forkert's 'Desirable' in 1936. 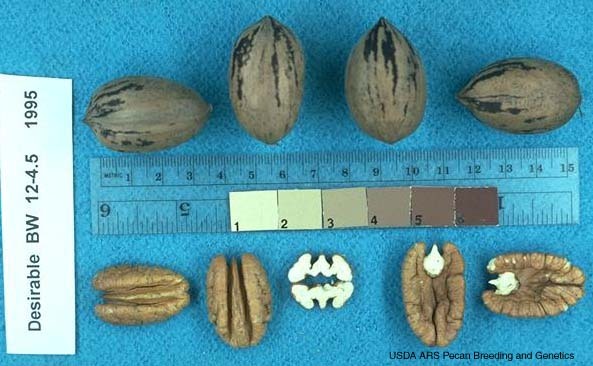 Nut: elliptic with obtuse apex and obtuse to rounded base; round in cross section; shell rough, with elevated suture; 38 nuts/lb, 54% kernel; kernels golden in color, with wide dorsal grooves. Protandrous, with abundant early pollen shed and mid- to late- season pistillate receptivity. 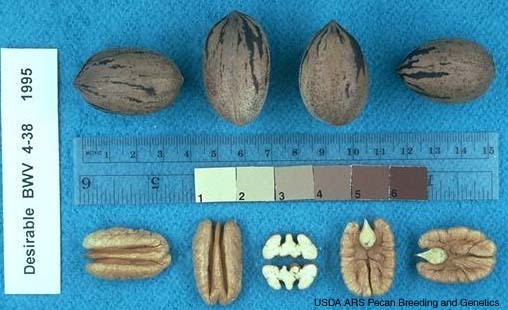 Bears in about 6 years and makes consistent, moderate production of high quality nuts, due in part to self-thinning fruit drop that reduces the number of nuts per cluster. Ripens in late mid-season, shortly after 'Stuart'. Susceptible to scab. Recommended for use in commercial orchards from GA west to TX. Recommended (1990) for planting in AL, AR, FL, GA, LA, MS, NC, SC, and TX.